September 27, 2018 Fallout 76 still won’t have cross-play at launch. The cross-play dream was revitalized this week with news that barriers have broken down around Fortnite – but Fallout 76 cross-play is still off the table for now. We heard that the feature wouldn’t make it back at E3, but that was before Sony’s turnaround on the subject. However, the change in policy hasn’t come soon enough for Fallout. Bethesda’s communications head, Pete Hines, posted a congratulatory message to Sony on Twitter following the news. In the wake of a multitude of comments from fans, he had to clarify that this doesn’t affect the Fallout 76 launch. Folks, chill. I work with a lot of devs and games for whom this is important going forward. 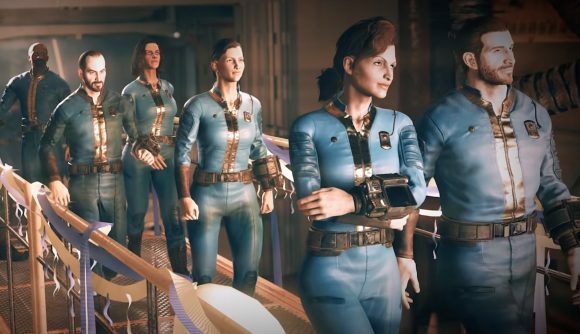 Fallout 76 does not support crossplay, for a number of reasons. I have no idea if it ever will. But I assure you it is not on our radar right now as we focus on B.E.T.A. and Launch. The Fallout 76 beta launches next month, giving us all an early look at the game a few weeks ahead of the proper release. You’ll have to stick to playing with friends on your platform of choice for now.